Last night, in preparation for a little wine and cheese party that we were hosting, I decided that I should try my hand at making a cheese-friendly chutney. I had some sad looking stalks of rhubarb in the fridge so I gathered those, along with an apple and some other things I had around and whipped one up. A chutney is really quite simple to make. Just chop, boil and stir and you’re done in about 20 minutes or so. Instead of brown or white sugar, I used fruit sugar (aka fructose). I could have said that I chose the fruit sugar because it has a quick jelling point (it said so on the bag) making it perfect for jams and chutneys, but I used it because I’m suffering from tendonitis and I didn’t want to heave the huge sugar cannister down from the top shelf. However, if you don’t have fructose handy, regular sugar will do. As for the party, there were lots of bottles of wine, an array of fine stinky cheeses, an assortment of crackers, fresh grapes and slices of apples. Somehow, I forgot to bring out the rhubarb chutney until well into the evening. Oops! No matter, while the chutney ain’t pretty, it sure is a flavour workhorse. It was delicious with the wines and cheeses. Plus, it means that I have leftovers ready for Thanksgiving dinner this Monday! I’m sure it will go well with turkey and the rest of our harvest meal. And completely off topic, I have a new post over at the Food Network Canada blog, Eating Well. It’s my review of the Taste of Health (a vegan & vegetarian event). Take a looksie! In a small saucepan, heat up the first 7 ingredients and bring to a boil, stirring occasionally. Turn down heat to medium, adding in seasonings and cranberries. Stir and taste, adding more sugar if necessary. Once it has thickened, remove from heat and let cool. Refrigerate and then serve. Keep in a tightly lidded jar in the fridge…it should keep for 3 weeks or so. Wow! It looks so tasty; I wish I could make it in my dorm room. Sadly, my “kitchen” consists only of a mini-fridge, a microwave, a toaster, and a coffee pot; no can do. Just fyi, I tagged you in my blog! Okay I have to be honest here, I have a great dislike for rhubarb. However, I have a great like for chutney!! I had Indian food for lunch today at and Indian buffet place and piled my plate high with all sorts of great foods. I also plopped a heaping spoon of mango chutney on my plate…because it’s so darn good! 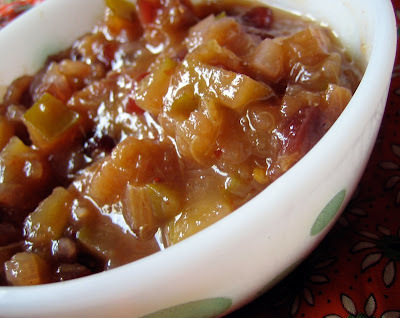 I would probably like to try some rhubarb chutney before I decide to make, just it in case I don’t like the taste. Ouch! tendonitis 🙁 Never had it but it sounds painful. You would be most welcome at my jam and preserve swap with a few jars of this chutney. Sounds amazing! This actually looks really nice! I mean, I wouldn’t wear it 🙂 But it looks good for chutney. I love chutney period. When I was very young my mother remembers me eating Major Grey’s Chutney out of the jar. Today I put chutney on anything. My fav’s are pasta, hummus and grilled cheese. I am stealing this recipe. kelli, yeah, i’m not sure how you could make this in a dorm room! bijoux, this chutney wouldn’t be great with indian flavours (i don’t think anyway), but it would go great in a grilled cheese or with turkey! aimee, if i could make preserves, i’d love to join in! i usually just make 1 batch that stores in the fridge. sigh. steal away dawn! yes, chutney goes so great with so many things! This looks great! I’m a big fan of chutney, and I think it plays beautifully with cheese. That sounds like it would be perfect for a wine and cheese party. Happy Thanksgiving! kevin, it turned out pretty good. usually i make cranberry chutneys so this was a nice variation.